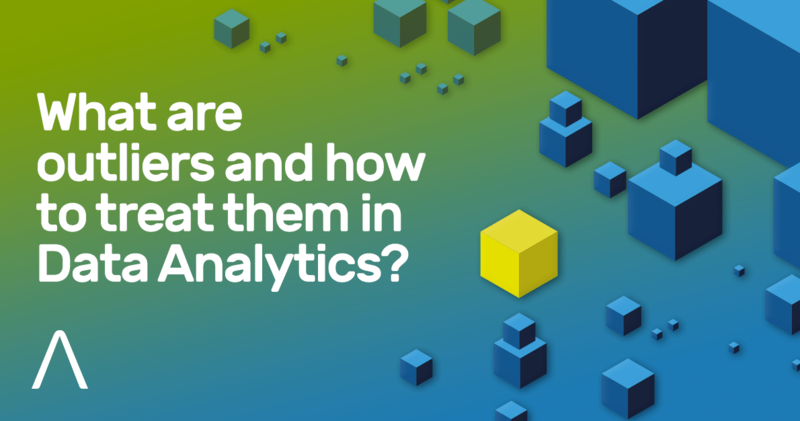 What are outliers and how to treat them in Data Analytics? What are Outliers? They are data records that differ dramatically from all others, they distinguish themselves in one or more characteristics. In other words, an outlier is a value that escapes normality and can (and probably will) cause anomalies in the results obtained through algorithms and analytical systems. There, they always need some degrees of attention. the behavior of outliers may be precisely what is being sought. While working with outliers, many words can represent them depending on the context. Some other names are: Aberration, oddity, deviation, anomaly, eccentric, nonconformist, exception, irregularity, dissent, original and so on. Here are some common situations in which outliers arise in data analysis and suggest best approaches on how to deal with them in each case. 1 How to identify which record is outlier? 4 Conclusions: What to do with outliers? How to identify which record is outlier? The simplest way to find outliers in your data is to look directly at the data table or worksheet – the dataset, as data scientists call it. The case of the following table clearly exemplifies a typing error, that is, input of the data. The field of the individual’s age Antony Smith certainly does not represent the age of 470 years. Looking at the table it is possible to identify the outlier, but it is difficult to say which would be the correct age. There are several possibilities that can refer to the right age, such as: 47, 70 or even 40 years. In a small sample the task of finding outliers with the use of tables can be easy. But when the number of observations goes into the thousands or millions, it becomes impossible. This task becomes even more difficult when many variables (the worksheet columns) are involved. For this, there are other methods. One of the best ways to identify outliers data is by using charts. When plotting a chart the analyst can clearly see that something different exists. Here are some examples that illustrate the view of outliers with graphics. In a study already published on Aquarela’s website, we analyzed the factors that lead people no-show in medical appointments scheduled in the public health system of the city of Vitória in the state of Espirito Santo, which caused and approximate loss of 8 million US dollars a year million. 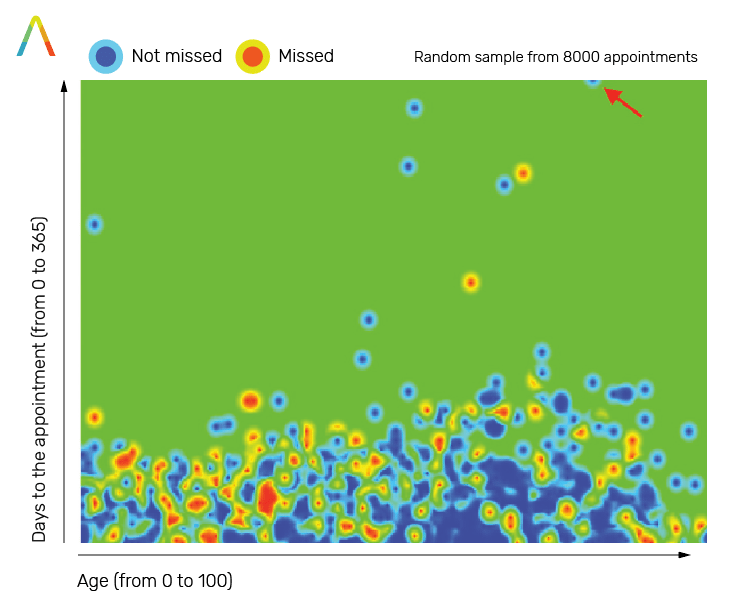 In the dataset, several patterns have been found, for example: children are practically not missing their appointments; and women attend consultations much more than men. However, a curious case was that of an outlier, who at age 79 scheduled a consultation 365 days in advance and actually showed up in her appointment. This is a case, for example, of a given outlier that deserves to be studied, because the behavior of this lady can bring relevant information of measures that can be adopted to increase the rate of attendance in the schedules. See the case in the chart below. On May 17, 2017 Petrobras shares fell 15.8% and the stock market index (IBOVESPA) fell 8.8% in a single day. Most of the shares of the Brazilian stock exchange saw their price plummet on that day. This strong negative variation had as main motivation the Joesley Batista, one of the most shocking political events that happened in the first half of 2017. This case represents an outlier for the analyst who, for example, wants to know what was the average daily return on Petrobrás shares in the last 180 days. Certainly, the Joesley strongly affected the average down. In analyzing the chart below, even in the face of several observations, it is easy to identify the point that disagrees with the others. This is an outlier case that can harm not only descriptive statistics calculations, such as the mean and median, for example, but it also affects the calibration of predictive models. A more complex but quite precise way of finding outliers in a data analysis is to find the statistical distribution that most closely approximates the distribution of the data and to use statistical methods to detect discrepant points. 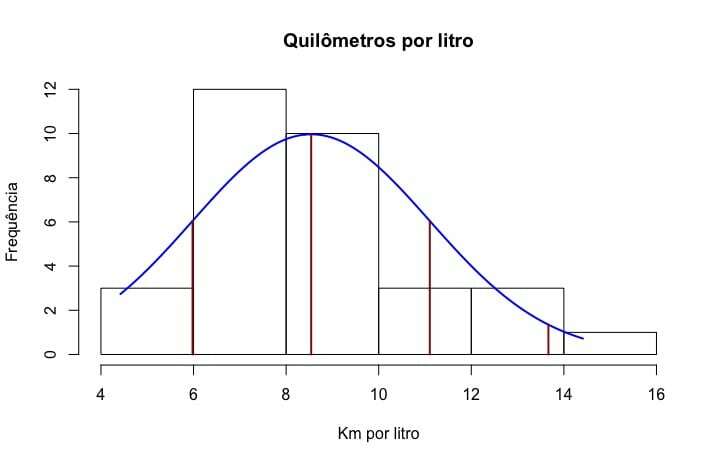 The following example represents the histogram of the known driver metric “kilometers per liter”. The dataset used for this example is a public dataset greatly exploited in statistical tests by data scientists. The dataset contains “Motor Trend US magazine” of 1974 and comprises several aspects about the performance of 32 models. More details at this link. The histogram is one of the main and simplest graphing tools for the data analyst to use in understanding the behavior of the data. In the histogram below, the blue line represents what the normal (Gaussian) distribution would be based on the mean, standard deviation and sample size, and is contrasted with the histogram in bars. The red vertical lines represent the units of standard deviation. It can be seen that cars with outlier performance for the season could average more than 14 kilometers per liter, which corresponds to more than 2 standard deviations from the average. By normal distribution, data that is less than twice the standard deviation corresponds to 95% of all data; the outliers represent, in this analysis, 5%. 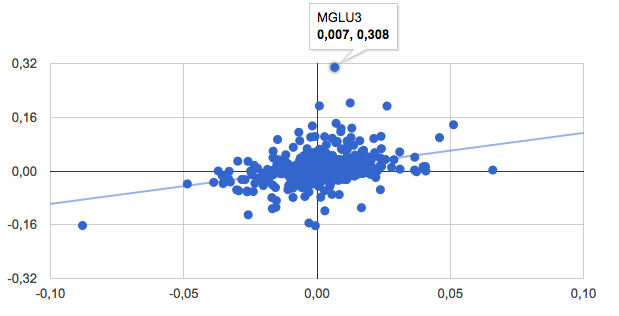 Conclusions: What to do with outliers? perform a separate analysis with only the outliers: this approach is useful when you want to investigate extreme cases, such as students who only get good grades, companies that make a profit even in times of crisis, fraud cases, among others. use clustering methods to find an approximation that corrects and gives a new value to the outliers data. in cases of data input errors, instead of deleting and losing an entire row of records due to a single outlier observation, one solution is to use clustering algorithms that find the behavior of the observations closest to the given outlier and make inferences of which would be the best approximate value.